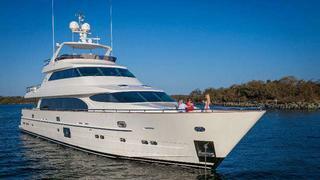 Horizon Yachts announces that repeat U.S. owners have ordered a new P105 tri-deck motor yacht, built to DNV class. The P105 is the second Horizon motor yacht for the owners - they previously built an 82-footer - and has been customised to specifically meet their cruising and lifestyle needs. The owners worked extensively with Horizon's in-house designers on build details and interior décor. With delivery expected in January P015, the new Horizon P105 will debut with Horizon Yacht USA at the 2015 Palm Beach International Boat Show.